Warrenpoint’s Jamie Fletcher kept a cool head to hold off a late rally from Athenry teenager David Kitt and win the AIG Irish Amateur Close by one hole at Galway. The 21-year old former Boys international confessed that he once struggled to keep his emotions in check on the golf course. But thanks to his Barton Shield and AIG Irish Senior Cup experience alongside the likes of veteran international Colm Campbell, he became the third Warrenpoint man to win the Irish Close title in the last 37 years. “I have seen my game come on in the last few years by playing Senior Cup and Barton Shield. When the whole club is down watching you, you get used to the pressure. 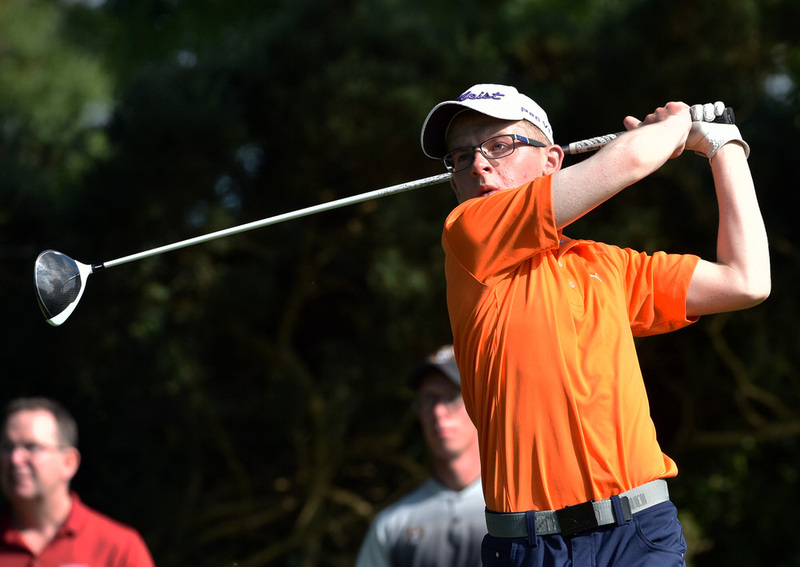 Fletcher beat Castleknock’s Paul Coughlan 2 and 1 in the morning semi-finals as 17-year old Kitt defeated Belvoir Park’s Marc Nolan by the same margin. The Warrenpoint man was the favourite for the title having won the Faldo Series in 2015 and last year’s North of Ireland Amateur Strokeplay. But he didn’t have it all his own way in the final against the diminutive Kitt, who came back from three down with four to play to take the match to the 18th. Kitt three-putted the fifth to go one down, then bogeyed the sixth after overshooting the green to fall two holes behind. He could have been three down after seven holes but played an exquisite pitch stone dead to halve the hole in par fives as Fletcher three-putted after leaving his 40-foot eagle putt eight feet short. But after forcing Fletcher to hole a six footer for a half in birdies at the eighth, Kitt made a slick 15 footer for birdie at the 10th to reduce the deficit to just one hole in a final that saw both players go around in an estimated two over 72. The young Galway talent was giving up more than 60 yards to Fletcher off the tee and made life difficult for himself by missing three times inside four feet, following his three-putt at the fifth with two more three three-putts the 12th and 14th to find himself three down with four to go. To his credit, he did not give up and when Fletcher drove behind a tree at the 15th and bogeyed to see his lead reduced to two up, he found himself just one down with two to play when Fletcher took two to escape from greenside sand at the 16th and racked up a double bogey six. The champion showed true grit on the run home, however, two putting for par at the 17th before hitting a smooth, 155-yard eight iron to 25 feet at the 18th after Kitt had overshot the green by a yard. After Kitt’s chip finished inches short, Fletcher made no mistake and two putted for the title. “It gives me a lot of motivation to know that I can win,” said swimming instructor Fletcher, who will almost certainly shelve plans to turn professional. “My dad was talking about me turning pro and playing the Europro Tour, but maybe after winning today, I will stick around for another couple of years. Kitt will have more days in the sun and he hopes to lift the Fred Daly Trophy with Athenry on Tuesday. While he was disappointed to lose, he said: “If you had said to me at the start of the week that I’d reach the final, I’d probably have taken it." David Kitt (Athenry) bt Marc Norton (Belvoir Park) 2/1. Fletcher bt Kitt 1 hole.